First, we preheated the oven to 500 degrees Fahrenheit. Rob was in charge of the vegetables, so he chopped up some onions and one clove and garlic and simmered them in some olive oil. 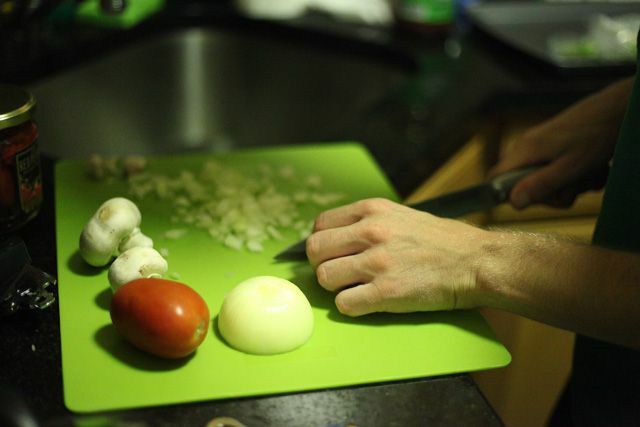 He also sliced up one roma tomato, some red pepper, and two mushrooms. I'm anti-mushroom so he only covered half the pie with some of those bad boys. I was in charge of the construction of the pizza so I pounded out that dough like a pizza expert (with some flour sprinkled on the surface), evenly poured on the sauce, and very generously scattered the cheese (you can never have too much cheese on pizza). 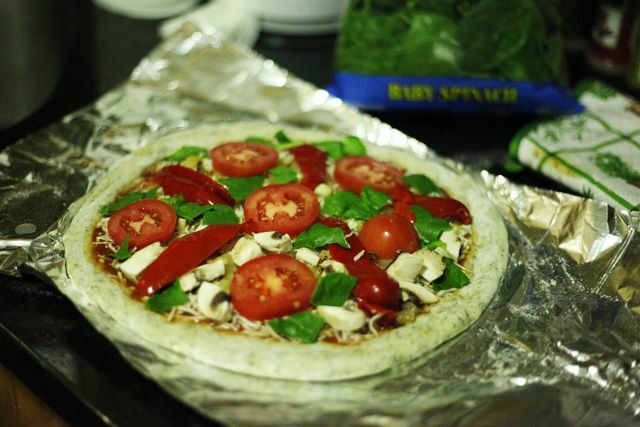 We ripped up some spinach leaves as a finishing touch and then popped our pizza into the oven. 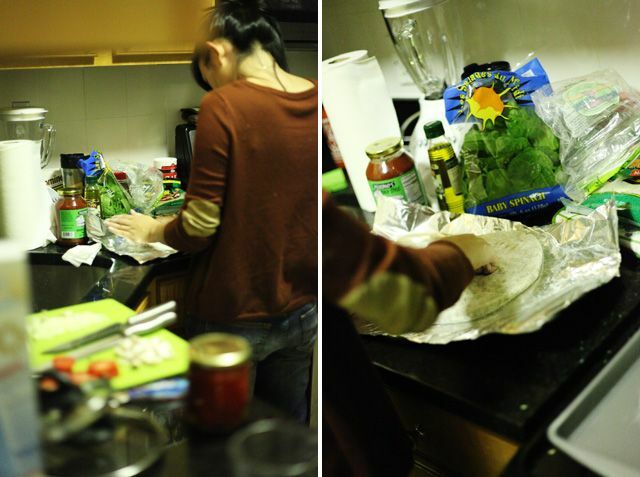 Our only mistake was that we only baked our pizza for 8 minutes, since that's what the packaging suggested. 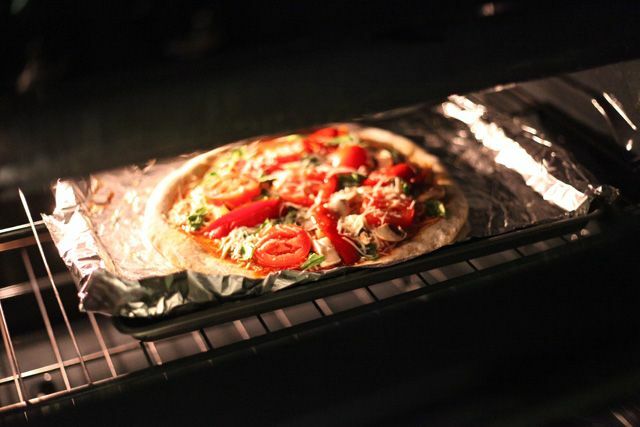 My friend Stephen, who's an epic food blogger, later recommended that we let the pizza bake for at least 15 minutes. Whoops! At least it was still delicious. I think I'll be trying out his pesto pizza recipe next. 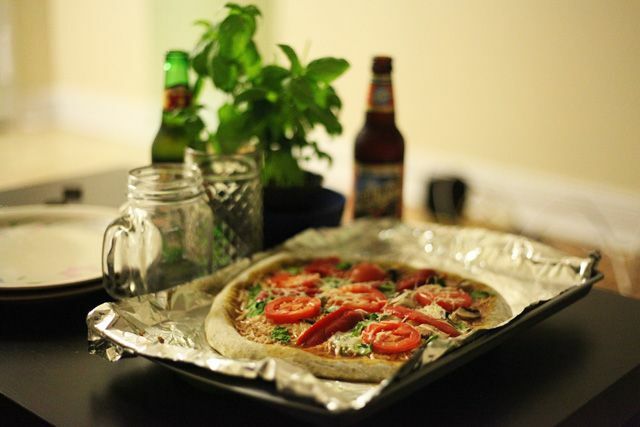 Making homemade pizza is DA BEST! 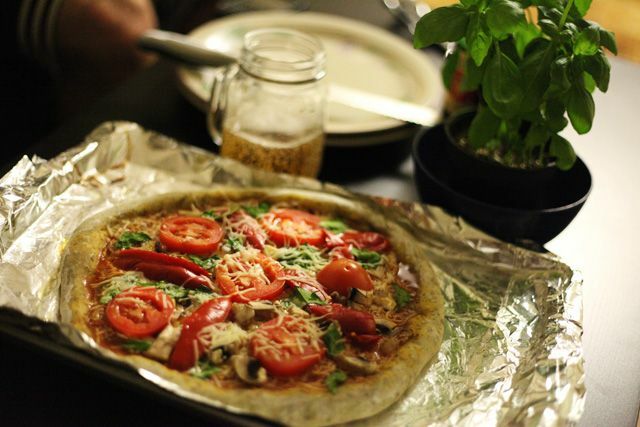 My mom found this amazing whole grain pizza dough recipe and so I always look forward to it. I love the idea of putting cut up tomatoes on it, though... 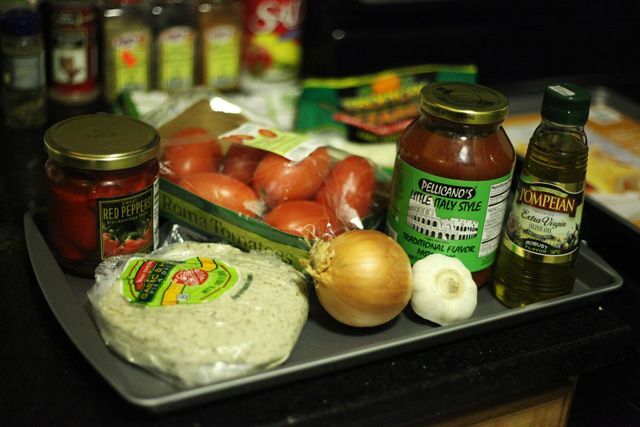 I actually haven't tried tomatos on my pizza (cept for the sauce, 'course). The pizza looks great! I'll have to bring you some pesto the next time I see you. This looks so delicious! And pesto pizza also sounds delicious. You should definitely share your results!